Die Heiterkeit came to my attention while I attended my last SXSW before I moved to Germany. I thoroughly enjoyed the brief set I saw. Since then, bandleader Stella Sommer put out an English-language solo album, 13 Kinds of Happiness, and just about a month ago, Die Heiterkeit released Was passiert ist. The new album is more condensed than their prior masterpiece, Pop & Tod I + II (2016), and may be even better. Hans Unstern appeared alone with a harp. His voice was high and thin but well-paired to his intricate instrumental prowess. He occasionally strummed the harp to reveal its traditional beauty, but mostly relied on a plucking style that was a match for any piano or classical guitar arrangement. The counterpoint of the repetitive higher parts against a more dynamic bass part was an inversion of typical popular music norms, but this clearly wasn't standard-issue pop music. 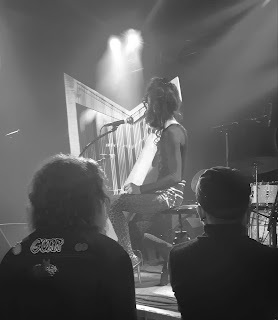 I was mesmerized by the fingerwork, even if the songs themselves weren't especially captivating. Naturally, I also appreciated his unconventional fashion and appearance. 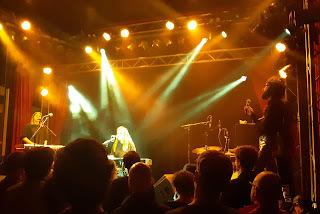 Die Heiterkeit again performed as a four-piece, but from what I could tell, the entire band besides vocalist/guitarist/keyboardist Stella Sommer has changed since the last time I saw them in 2017. Their sound and aesthetic were so similar that I didn't even notice at first. The other three members again filled the roles of keyboardist/vocalist, bassist, and drummer. The band played songs from all four of their albums, unsurprisingly focusing on their latest. The new songs were almost across the board a delight, and the band seemed more engaged playing them. The bassist played a slightly more active role, filling much of the melodic space and even taking a solo in one song. Sommer mostly strummed a capoed guitar with clean and subdued tones, but also switched off with a keyboard, where she was able to show off a bit more dexterity. The cold but grandiose tones of their albums came somewhat more alive on stage, but other than a couple small hiccups, they played with an impressive tightness and accuracy. 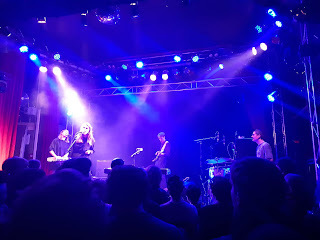 Sommer's deep and stately voice remained the highlight of the show. Her style struck me as something uniquely well-suited for singing in German, in that what would otherwise seem like an exaggerated enunciation is instead an expression of emotional depth and proof of mastery of the voice. After closing the main set, the band almost immediately returned for a lengthy encore of four more songs. For the latter two, Hans Unstern joined the band on the side of the stage to provide some additional harmony vocals. These last two were somber numbers that seemed like a fitting end, but the crowd continued cheering for another encore. The house music had come on and I was fairly certain it was over, but to my surprise, after a few minutes they filtered back out. First, Sommer played a song on guitar accompanied only by the bassist, and then she played a brief lullaby in English. It was perhaps an even more appropriate conclusion than the first encore. Die Heiterkeit risk sounding depressive and restrained, but something in their dramatic energy has the opposite effect. They were still fairly rigid on stage, but their concentrated focus resulted in a solid performance, and they came across more human than on their studio recordings. At times, one is left wishing for a flourish or some greater cause for excitement. But if you can do without that, it is easy to get entranced by their darkly beautiful tones. [Edit 2019.04.17:] Die Heiterkeit have published a video of the second encore. The two songs were "Kapitän" and the English folk tune "Lavender's Blue".